Having completed a spirited four-song run-through to jump-start the full band’s session at Twickenham on January 8, 1969, with the ancient “One After 909,” the Beatles managed to dig to the very bottom of the vault and the genesis of the Lennon/McCartney songwriting partnership. It’s a stretch to say the Beatles played “Too Bad About Sorrows” in the moments after they finished “One After 909,” itself a primeval composition, one John had said was his own, but Paul claimed to have shared credit writing. The spark of “909” propelled the group further down Memory Lane and over to 20 Forthlin Road. 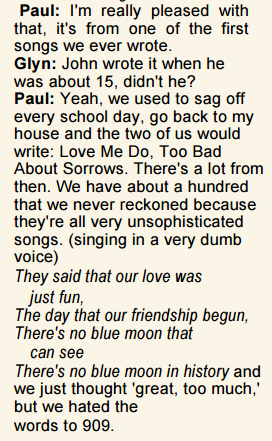 Dating back more than a decade to 1957, “Too Bad About Sorrows” has the distinction of being the very first Lennon/McCartney collaboration, per Paul. We would sit down with a school notebook which I have to this day, an old tattered copybook, blue lines on white paper, and I would write down anything we came up with, starting at the top of the first page with ‘A Lennon-McCartney Original’. On the next page, ‘Another Lennon-McCartney Original’; all pages have got that. We saw ourselves as very much the next great songwriting team. Which funnily enough is what we became! We started off, I think, with a song called ‘Too Bad About Sorrows’. They all had very simple chord structures but we learned our craft that way. Paul said much of the same here, on the South Bank Show in 1978. Lasting about 15 seconds long, all we really hear on the January 8, 1969, performance is John singing the first line of the song — the title — over incoherent guitar and bass accompaniment, and two more garbled lines: “Too bad about love/There’ll be no tomorrow.” The performance itself is obviously forgettable as are so many of the brief stabs at songs these sessions, but this is particularly notable as it enabled the public — via decades of bootlegs and now YouTube clips like the one below sourced from those same bootlegs — to hear the very first Lennon/McCartney song. The group would similarly perform a taste of “Too Bad About Sorrows” nearly two weeks later after the sessions shifted to Savile Row. Straight out of the stab at “Too Bad About Sorrows,” John playfully delivered the line, “There’s no blue moon in history,” before letting out a giggle. Seconds later, he and Paul shared vocals on an impromptu version of “Just Fun,” the song John had just referenced and what is considered the second collaboration from the Lennon/McCartney team. In between, John delivered the line about “pot-smoking FBI members” that would eventually appear on the Let It Be album, and referenced in the last post. Two days earlier, “Just Fun” had come up in conversation with director Michael Lindsay-Hogg and producer Glyn Johns in a sequence that ended up in the Let It Be film as they discussed the revival of “One After 909.” Paul weakly sang the opening lines from “Just Fun” as part of a greater recounting of the early days of writing with John. The Jan. 6 discussion of “Just Fun,” from the “Get Back” book. This attempt wasn’t as comprehensive as the abbreviated January 6 version, lasting just a single line: “They said that our love was just fun.” Things broke down as George interrupted to go over new songs to be rehearsed. “Just Fun” wasn’t performed — at least at these sessions, and that we know of — by the Beatles again. Like “Too Bad About Sorrows,” this wasn’t any kind of groundbreaking performance, but it’s a slice of history that’s thankfully preserved. Beyond the South Bank Show clip above, Paul has dusted off “Just Fun” elsewhere, including two verses’ worth of the song at a 2004 soundcheck in Zurich, of all dates and places. Quite oddly, John’s singing of the line “There’s no blue moon in history” shows up in the once indispensable 1982 documentary “The Compleat Beatles” (this author’s first real exposure to the band’s history) as background during an interview with George Martin about Beatles For Sale, for some reason. So in that strict sense, it’s actually been officially released, albeit a few seconds’ worth. Unfortunately, “Just Fun” is a terrible, terrible, awful lyric. Even Paul agrees. There’s never been a blue moon in history? For heaven’s sake, Paul, there was a blue moon over Liverpool in August 1956, 11 months before you met John and wrote this song! It turned out OK for these guys, though, and Lennon/McCartney — together and alone — figured it out. For instance, we all can agree that “She Said She Said” — the next song the group played on January 8, after a mention from George — is a quite terrific lyric. Considering the band never performed the song live, and presumably hadn’t played it at all together in two-and-a-half years, the group holds together the first verse decently enough. As we recount events two days before George left the Beatles on January 10, it’s worth marking that the original 1966 recording session of “She Said She Said” was missing Paul. He walked out after he “had a blarney” with the others, the first Beatle to tentatively leave the group.